Chances are no matter how organized you are things accumulate on your kitchen counters and grow into piles, and those piles beget piles. It’s like the Duggar family with 19 kids and counting—you take care of one and minutes later two more spring up. All sorts of things pile up: paper, mail, small animals . . . and these piles take on a life form of their own. If fact, a pile is probably forming on your kitchen counter as you read this. It has probably grown a mane of hair, a set of teeth and learned multiple languages by now. It’s not until you lose something important that you take action—something like your passport, your keys or your birth control pills. Then you rummage through the bottomless layers of strata until you either find what you’re looking for or strike oil. Once, my family uncovered a rabbit’s foot left from my teenage daughter’s 3rd birthday party. That was an exciting find, until we discovered the rest of the rabbit. Things pile up for a variety of reasons. Sometimes we leave things out as a reminder to act on them, like a prescription that needs to be filled, a party invitation that needs a reply, or your unread copy of “Conquering Clutter.” Other times we leave stuff out because it doesn’t work—a deck of cards with missing deuces, a broken flashlight, “miracle” rejuvenation cream . . . But mostly we leave things out because we’re just too lazy to put them away. Men are particularly guilty of this, which explains why we finally invented pants with zippers. There is no real cure for piling. It’s one of those things in life that’s unavoidable, unless you’re a hobo or a monk. But there is a helpful trick, which is to think of your pile as a home mortgage. If it grows too big it can smother you and cause you to lose your house. The best treatment, therefore, is to keep it down to a manageable size through feverish sorting preceded by a tetanus shot. If you’re too late and your piles have taken over the house to the point that they mimic the New York City skyline, there’s only one thing left to do—move—preferably to a house with no kitchen countertops. I believe in miracles and find anything in my desk piles. Oops. What I meant to say is I believe in miracles and CAN find anything in my desk piles. Order in the disorder. Life is chaos. “Order in the disorder.” I like that. Just as I was about to attack my piles I get distracted by your organizing advice. Now how does one address two years worth of piles ignored while I was in grad school? I pray there are no dead animals but those pesky fruit flies have been accumulating here. What is a girl to do????? I hope you were careful to purchase a house without kitchen countertops. 😉 Congrats on your new house and good luck with the move! 1920! Did they have fridges then? Too funny! I was thinking ice box as I wrote that. Thanks for following up. So interesting! Ha Ha most of us have piles of unwanted stuff that ought to be cleared. But a clutter in the house is better that a clutter in the ‘Mind’. I hear meditation works well for a cluttered mind. Too bad I can’t meditate the piles off my countertops! The workplace also provides additional opportunity for pile replication. I’m so busy keeping on top of the papers at school that the ones at home can often grow unchallenged. One day I will die beneath a pile of unread credit card offers and AAA travel magazines. Jen, I would never allow that to happen to you! I would force my way into your house, rush to your side, dig you out of the rubble, and read you the credit card offers and AAA travel magazines. My husband makes piles of stuff which are not to be touched and when he fills one table he moves to another…..we have moved…. Oh my. Have you considered slipping a $100 bill at the bottom of each pile? Funny you posted this today. I am in serious pile- destruction mode currently. I have done a serious make over on my bedroom, and now there is the kitchen x 2, the house office and my office. Plus other piles around the house. I think so. Part one done. And I feel so much better for it. Oregano comes from a family of pile makers. He waits until the pile collapses under its own weight and structural imbalance. To him, the avalanche is the universe’s way of telling him it is time to clean up the piles. Don’t tell him, but a few of those avalanches weren’t a natural occurrence. I hope those neglected piles don’t contain any tax bills! 😉 Thanks for your kind words! 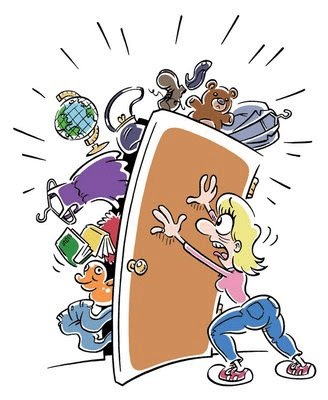 Clutter = stress in my book too! I’m glad you enjoyed my blog, thanks! Ah, the byproducts of American consumer-gluttony, hoarding, or OCD; not implying anything to you Lisa! But honestly, I’ve found as said American and a father of two, once a husband, and the never-ending bombardment of consumer marketing trickery — the telecommunications industry being the epitome — our home can slowly, in subtle menacing ways, bust at the seams with all the crap we unconsciously accumulate…UNTIL we do something like moving, or as I’m gradually learning now, when I must plan for my mother’s geriatric years and being the primary executor of her house and the DECADES of stuff she has accumulated! Comical post Lisa. Thanks for sharing! Ah, the sin of gluttony. You make a good point, Professor. I agree, and I’ve recently made progress in my efforts to scale back. The one thing I continue to accumulate is unwanted facial hair. I can’t control everything. Good luck with your mother. It sounds like you have your work cut out for you. Loved your pants with zippers line! You write like you’ve been in my house! We call ours the Command Center. My husband threatens to throw everything away on a daily basis. –signed, your friend the pack rat. Dear Pack Rat, don’t you think Bed Bath and Beyond should sell a clutter lid, so we can cover our piles and not have to look at them? Oh, but then I suppose we’d own one more item of clutter. . . I wait for all the paperwork to pile up to a manageable stack, sit down importantly and handle them feeling great. But pile I make! The piles were under control until the two college kids came home, now I cannot even see the top…great post. I’ll have to prepare for that myself soon– watching the summer piles grow along with college tuition. Not only no kitchen counters, but no “junk drawers”, either! Oh yeah, that pile on the kitchen countertop… I go through it when it gets too high or there are several piles. Right now I see 3 small piles and I can’t stand it! I’ve actually never understood that expression because in most cases, it makes no sense! I’d love a place where everything has a place … and is in its proper place. I, too, have fallen victim to the growing piles of stuff on my counters. And, I’ve had to spend money to replace needed documents to renew our drivers’ licenses because the originals apparently took a trip somewhere without us. Thanks, Lisa, for the amusing chuckle on our common frailty. Oh, the piles! They’re killing me! At least now, the school year’s over and the piles will stop growing exponentially, the way they have for nine months. Oy. Love this post, especially because you found a way to work the word “strata” in. My partner, Jack, has way too many piles and constantly loses something in them. He piles them in my way so I trip over them, too. This will make a great podcast story. Will you allow me to narrate it? I just uploaded my narration of your funny story about clutter, http://kriskkaria.podbean.com/. Thanks so much for allowing me to narrate it. My pleasure, Kris. Thanks for forwarding the link. Our kitchen counter is currently stacked with piles of paper, and also the wall organizers that I bought to corral the stacks of paper… funny post! Well, they’re heavy. Waiting for my husband to help! hi there… thanks for visiting my blog! We’re kind of neighbors in the real world. And OMG do I have some piles in my kitchen… they drive my husband nuts. HIS piles don’t bother him though… he’s funny like that. I think part of my problem is a lack of places for things to have a “home”. I could put it away if it had a place to go! I understand. “A place for everything and everything in it’s place” sounds so simple, but we need space for place! AnElephant, who is a mere male, laughed aloud at this. He sometimes forgets to tuck his trunk away carefully! Ah, well, better a laugh than a sneeze! Have you been in my kitchen? Sadly, I see myself in these words! On the other hand, and in my defence, when you do eventually get around to de-cluttering it is SO liberating! You’re right about that. It is cleansing, physically and spiritually!